All fabrication is done on site. 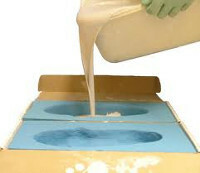 We refurbish ALL types of orthotics. We make Full-length, 3/4 length, Diabetic, Functional, Accommodating, Rigid, and Semi-rigid. Most people have one foot that is larger than the other, so fit your shoes to your larger foot. When trying on shoes, walk around the store to ensure that they are comfortable. The toe box should have ample room so that you can wiggle your toes. Orthotics are designed to accommodate foot deformities, eliminate and prevent muscle stress, reduce pain and aid in the healing process. No prescription needed for accomodative orthothics. A Pedorthist is the title of a professional who has specialized training to modify footwear and employ supportive devices to address conditions which affect the feet and lower limbs. 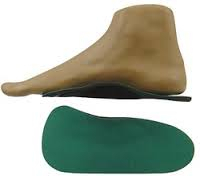 Orthotics have been proven to help a number of ailments as well as treat pain in a wide veriety of situations. What are you waiting for? Call us for a free Consultation today! If you're in or around the Metro Atlanta, Gwinnett area and are in search of outstanding custom shoe lifts, custom orthotics, and shoe elevation solutions for leg length discrepancy, diabetic neuropathy, foot pain relief, and other related needs, you're exactly where you need to be! Lilburn Shoe Repair and Pedorthics is the premier authority in top quality shoe repair, mail in shoe lifts, and custom shoe elevation products and services that are tailored to each client's individual needs. We specialize in shoe repair, boot repair, diabetic shoes, orthopedic shoes, shoe elevations, and custom orthotics. We have a storefront for clients in the Metro Atlanta area but we also serve customers from all parts of the country. As one of the companies that pioneered Pedorthics, we uphold the highest standards of service that truly aims to deliver the customized solutions our clients need. With over four decades of proven excellence and reliability in the industry, we are your top choice for all your foot care needs which include foot pain relief, diabetic neuropathy relief, foot ulcer healing, leg length discrepancy solutions, and other related concerns. Committed to delivering total customer satisfaction, we will never sell you anything you don't need. As a C.Ped with a wealth of experience as a shoe repairman, you can be sure that your custom orthotic needs are in highly capable hands you can trust every time you come to us here at Lilburn Shoe Repair and Pedorthics! For a free consultation, please call 770-921-4470 or email us at [email protected] today.